I’ve neglected these pages for too long so, to get back into the swing; here’s an update of what’s been happening in my fishing world. Firstly, the new rod [see picture below] works just fine! 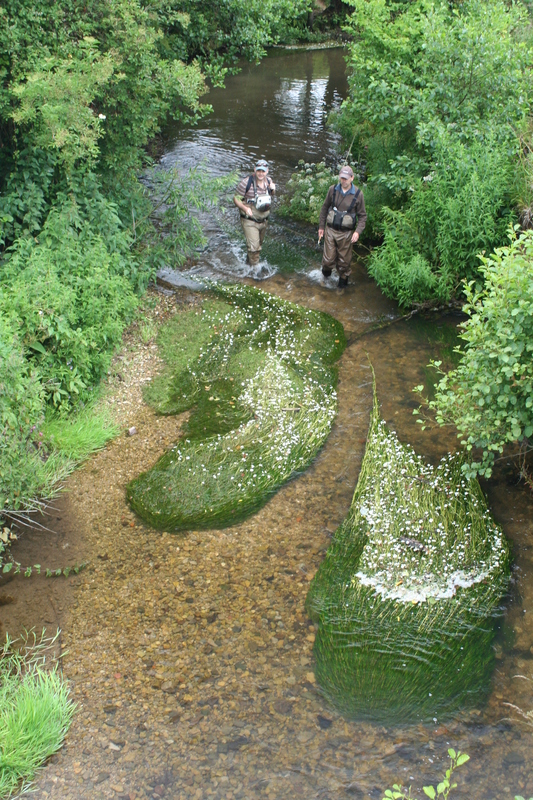 I was invited to fish a short, very private section of the River Churn at the fag-end of the Mayfly season. I took 2 fish in the first three casts so I know that we are going to get on. Once again, thanks Bob, she’s a beaut! Like most anglers I’ve been staring in despair at the weather forecasts wondering when things would change for the better. Sure, I’ve managed the odd snatched hour when the rain’s held off long enough to make a trip out feasible but, even then, the cold gusty easterly has made things difficult and not exactly pleasurable. I did have a more pleasant experience yesterday morning when I fished the Kennels beat of the Charfield section of the Little River Avon. On Friday evening the water was starting to fine down but there was only about 6″ of visibility but, by Sunday it was greatly improved and just about perfect. In the short time I had I managed to winkle out a brace of 10″ brownies still sporting feint parr marks – a very encouraging clue as to the health of the river. I hear that the Monnow is still completely washed out so, until things improve I guess I’ll be staying to the east of the Severn. Whilst I may have neglected this blog I have not been entirely idle in the world of on-line fishing. I have been asked to give a much needed makeover to the Charfield AA’s web site. Though it’s still in it’s infancy you can get a sneak preview here – any comments, criticisms or suggestions would be most welcome. This entry was posted on Monday, July 14th, 2008 at 6:59 am	and posted in Little Avon, Tackle. You can follow any responses to this entry through the RSS 2.0 feed. Glad the new rod is working out for you! Top marks on the site as well mate! It’s looking great! Everything’s looking brilliant so far…design, content, easy to navigate, I can see you’re going to have maps on there which will be fantastic! Top marks mate! With out naming names, I wish my club would seriously rethink their site. Some of the ‘up to date’ information is more than 3 years old! Good work on the site though Adrian, I look forward to seeing the finished the result. Nice to get some constructive feedback on the site. It’s built on MS Small Business Live so there are no fancy authoring tools – everything is done on line – and we can have up to 5 Admins. Now, if only I could find a blog module..